We have launched an online exhibit here of our unique, stunning vases. They are all handmade and kiln-fired in Japan. The vases we offer can be used for floral arrangements, or they can stand alone as decorative works, adding beauty to any space. One of our clients shared a great article with us about kintsugi, the Japanese art of repair. The article, entitled “Kintsugi: The Centuries-Old Art of Repairing Broken Pottery with Gold,” goes over some details about the Japanese art repair history. Please take a look for an explanation of different kinds of kintsugi, and some of the artists that are taking the philosophy and the art to new places. We had previously posted a video on the interesting kintsugi on our blog. Feel free to check that post out HERE. We are celebrating the holidays by offering you 15% off your order. A great time to purchase some beautiful gifts! Offer starts today and goes through December 20, 2018. Please use code HOLIDAYSAVE when checking out to redeem your discount. We got our first snow yesterday, but hopefully, there will still be some more beautiful fall days left. 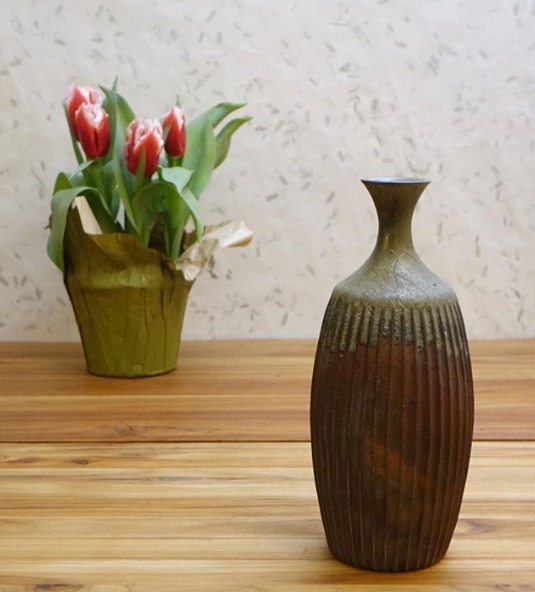 This Bamboo-shaped vase by Ichino Masahiko is made using his own akadobe glaze. Although a smaller vase, the Bamboo Vase stands out for its form, adding interest to any space. And we are celebrating fall to offer you 10% off your order! Offer starts today and goes through September 30, 2018. Please use code FALLEVENT when checking out to redeem your discount. In the interior decor world, "form vs. function" is a never-ending theme, and pottery is the ultimate form. As it is used for both its aesthetic purposes, as well as functioning as tea or dinnerware, or for flower arrangement, Japanese pottery has it all. 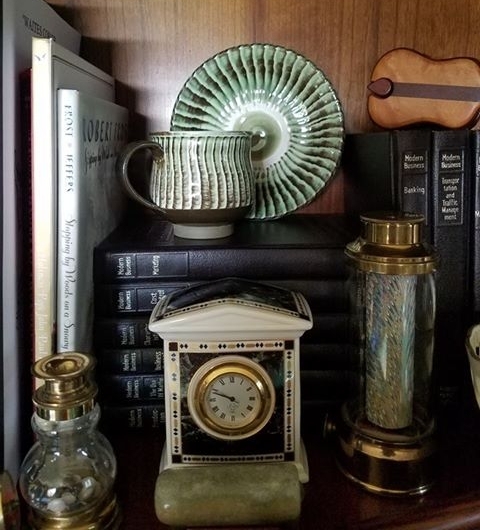 Here are some examples of our customers' uses of their teacups and bowls as decor, instead of using them as vessels for eating or drinking. For instance, if you are looking for plates, you can type in "plate" or "dish" to see a collection of items we offer. You could also search for a specific designer to see if we have any items or information on them. If you need more help or have more questions, you can always contact us directly! We keep in contact with many designers and hope to find something you truly want. Welcome to the Gallery Iwasa Blog! 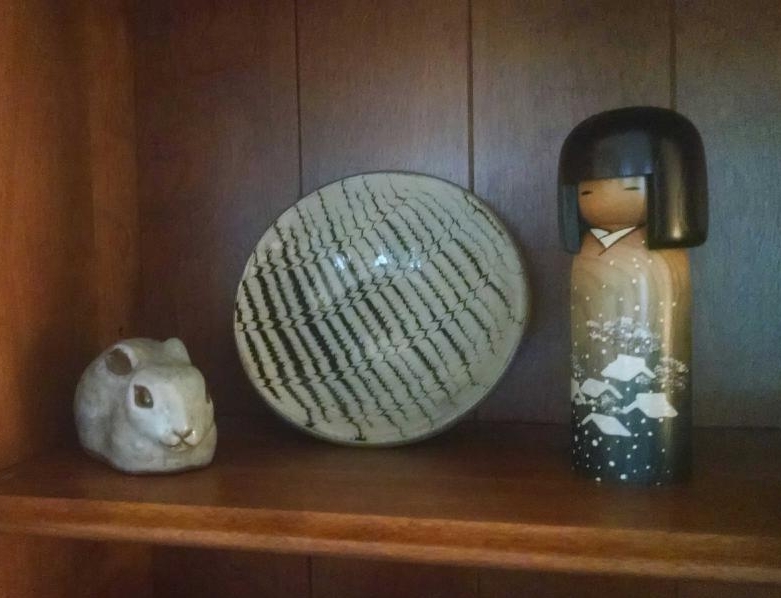 We enjoy sharing anything interesting we come across - from our Japanese handmade pottery to more finds about it. Please feel free to share any questions or ideas through the comment area here!